The name of this game has nothing to do with the television show by the same name. However, there are two witches battling to be the top one. Players can tell them apart based on their colors. There is one dressed in a red dress and hat and located over the first reel. Another is dressed with blue clothes and a hat and is situated over the fifth reel. They are stationery at the top of the screen and have random battles throughout normal play using their magical balls. As they face each other, the balls are shooting a stream of electrical currents toward the other. The colors collide in the middle until one is declared the winner. This is followed by the winner shooting an electric current down the first reel for red and last reel for blue. 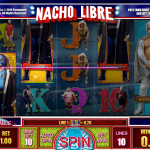 Players earn free spins after the battle. There is no music just a clunking sound during spins unless a payout lands. A rising chant is heard until the spinning starts again. There is a plethora of animation used with each symbol along with stars floating across the reels during spins. The scatter character winks, the owl blinks and comes grows in size, and the frog taps his hands and blinks his eyes in boredom. Winning takes off from the beginning of the game with generous payouts. There are 15 pay lines highlighted with different color lines and flashing symbols and lights for wins. The wild is an owl worth 2,000 coins. Merlin the Wizard is the bonus symbol that awards a jackpot. 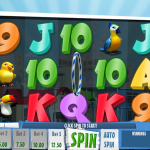 The Scatter is a woman dressed with a turquoise hat who awards multipliers and free spins. There is one symbol of the witches’ home and two other game characters. They include a young witch riding a broom and a king that has been changed into a frog. They are worth 1,000, 750, and 500 coins respectively. Several symbols are tools used by the witches including a magic ball, a stack of magic books, a pair of red shoes and purple hat, and the half crest of the moon. The first two symbols are valued at 200 coins, while the last two award 150 coins. There is a final set of symbols including the letters A and K that pay 100 coins and Q and J that award 50 coins. Players must earn five symbols for these payout amounts. The scatter awards players up to 200 coins or five free spins during regular play or 1,000 coins and 15 free spins for each bonus. After each bonus round, a brown ragged paper scroll displays the winnings. The wilds do not land as often as the scatter, although when it does it replaces the regular game icons. Players need three bonus symbols to trigger the jackpot feature. The object is to assist the wizard in finding the winning magic potion. Most jackpots can be in the thousands of dollars. There is solid action with this animated masterpiece as each symbol moves in some manner. 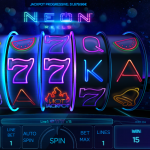 The added graphics with stars and pulsating lights around the winning reels enhance the theme. When the witches battle, it becomes a bit comical to see who will be victorious. Winning is consistent and payouts are decent. Softbet is the developer behind this jewel. Players will certainly visit regularly and add it to their favorites.